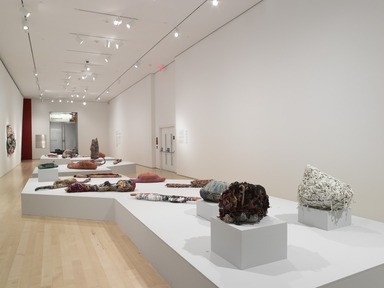 Judith Scott (1943–2005) began making art at age 44, as a participant in the studio art program at the Creative Growth Art Center in Oakland, California. Diagnosed with Down syndrome in infancy, Scott was also deaf and unable to speak. Institutionalized in her home state of Ohio at age seven, she lived in residential facilities for the developmentally disabled for 36 years before moving to California under the guardianship of her twin sister, Joyce, in 1987. After arriving at Creative Growth, Scott emerged as an artist of remarkable vision. This unexpected story has its roots in an extraordinary social and cultural experiment that unfolded in the social and political climate of the Bay Area in the late 1960s and early 1970s. Scott’s chance to become an artist grew directly out of social-justice movements rooted in the 1960s, feminism key among them. The political changes fought for by feminist, gay-rights and civil-rights activists paved the way for the disability-rights movement. Adopting similar strategies of protest and advocacy, people with physical and developmental disabilities gained tangible improvements including broader social services and significant new opportunities to do meaningful work. in isolation. Instead, she took part in an active creative community. By any standard definition, Scott was a contemporary artist: an artist of her time whose achievement reflects the culture in which she lived and worked. 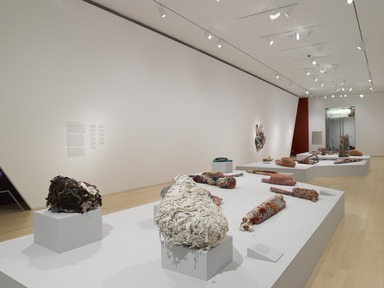 Judith Scott—Bound and Unbound is organized by Catherine Morris, Sackler Family Curator for the Elizabeth A. Sackler Center for Feminist Art, Brooklyn Museum, and Matthew Higgs, artist and Director/Chief Curator of White Columns, New York. This exhibition is made possible by the Elizabeth A. Sackler Foundation. Additional generous support has been provided by the Helene Zucker Seeman Memorial Exhibition Fund and Deedie Rose. People with disabilities are often seen in terms of their differences, and work made by artists with disabilities is commonly understood solely in relation to the biography of the maker. Such a narrow focus can undermine a full understanding of the work. At the same time, the cultural and social context in which art gets made is a legitimate part of reading the work. 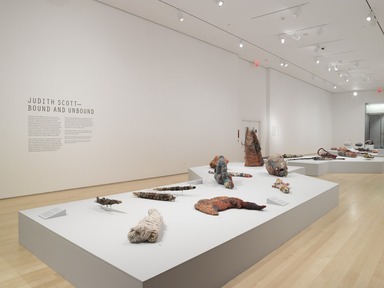 Because Scott made abstract sculptural objects that do not discuss her life experience, finding a balance between formal analysis on the one hand—what the work looks like and the materials it is made from—and useful biographical and historical context on the other becomes a challenge. The Creative Growth Art Center opened in downtown Oakland, California, in 1974. It is one of three still-active Bay Area art centers founded by the artist Florence Ludins-Katz and her husband, the psychologist Elias Katz, that serve an extended community of mentally, developmentally, and physically disabled adult artists. Creative Growth’s mission is to establish an environment that fosters and nurtures the creative process. Staffed by professional artists, the Center supports more than one hundred adult artists with disabilities who work alongside one another in a communal studio space. At Creative Growth the Katzes established a unique environment focused on artistic production rather than therapeutic goals. 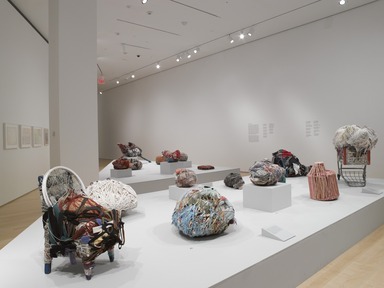 In this setting, disabled individuals, including those, like Judith Scott, who had previously displayed no creative inclinations, would be empowered to explore their own creativity at their own pace. 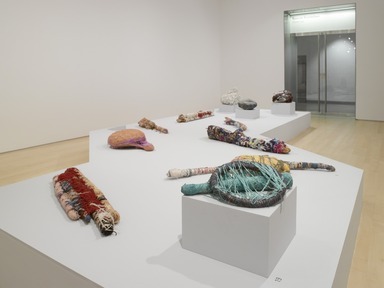 Given the complexities of her circumstances, as a deaf, largely mute woman with Down syndrome, and her inability to communicate in a conventional manner, Judith Scott was not in a position to explain her work. What she was actually making, and why she made it, therefore remains elusive. No matter how many associations her objects might evoke, art-historical or otherwise, ultimately we cannot know what, exactly, Scott may have been trying to articulate through her sculpture. Working without precedents or an exposure to art history, she fashioned idiosyncratic objects—organic, three-dimensional structures fastidiously assembled by hand from found and scavenged everyday materials—that clearly function as art even as they resist easy categorization. Although it is impossible to know whether Scott understood what she was making to be art, at Creative Growth she was, nevertheless, consistently exposed to other artists going about their business of making things: drawings, paintings, ceramics, tapestries, and so on. Whether or not she was aware of the formal concept of “art” as it is conventionally understood, she would have become keenly aware of the daily reality of the creative process—and seen that making objects was a completely reasonable thing for people to do. After working half-heartedly at painting and drawing for a number of months when she first arrived at Creative Growth in the spring of 1987, Scott was introduced to working with fiber by the studio artist Sylvia Seventy and soon began to produce wrapped objects. 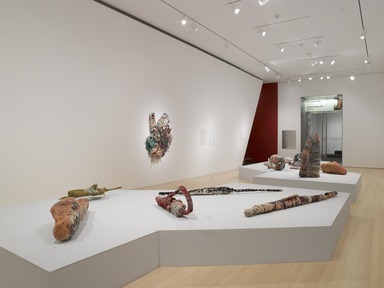 Once her routine had been established, Scott typically began a new piece with the process of enrobing a found object in fiber and yarn, adding other objects as the work grew and morphed. table fan, a crutch, or a shopping cart were hard even for Scott to disguise in woven and bound pieces. Scott worked at the same table in the studio at the Creative Growth Art Center on a single piece at a time, sometimes for weeks or months, before pushing the object away in a gesture of resolute completion. She did not revisit or express interest in reviewing works she was done with, though if she saw a piece exhibited at the gallery at Creative Growth she was known to offer an occasional affectionate wave or pat of acknowledgment. 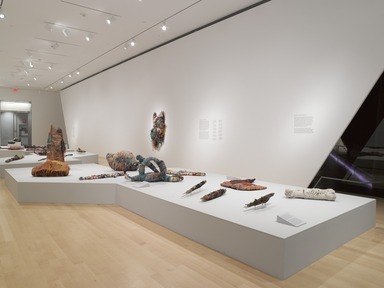 Each sculptural work by Judith Scott is composed of a variety of materials, including various fibers, torn fabrics, and found objects. Precisely itemizing the objects and materials in each and every work is a nearly impossible task. Not only are the kinds of fibers multiple and diverse, but some of the objects embedded within the pieces remain unidentified. 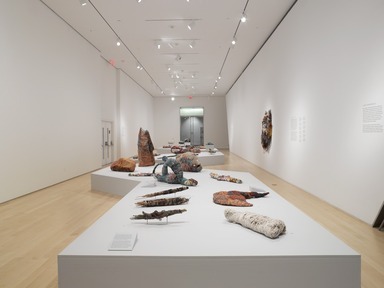 For the sake of convenience, each sculpture in the exhibition can be broadly described as composed of fiber and found objects. 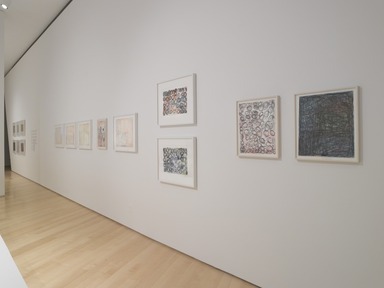 Scott’s works on paper usually contain a variety of mediums, including paint, graphite, colored pencil, ballpoint pen, and occasional collage elements. Signatures on the works on paper were added by Creative Growth staff when a work was completed; Judith Scott did not sign her work. 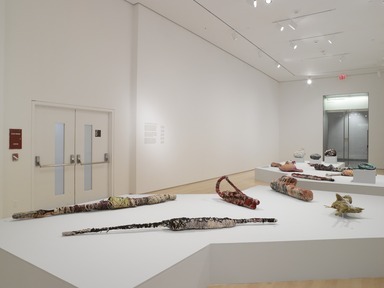 June 1, 2014 Judith Scott—Bound and Unbound will be on view in the Elizabeth A. Sackler Center for Feminist Art at the Brooklyn Museum from October 24, 2014, through March 29, 2015. 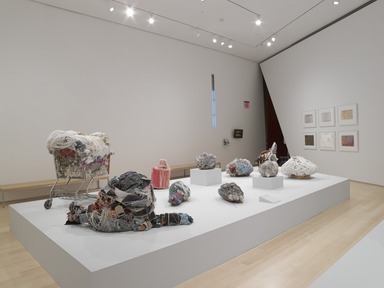 Focusing on Scott’s critically acclaimed fiber-wrapped, three-dimensional constructions, the exhibition features more than sixty works, including a selection of works on paper. 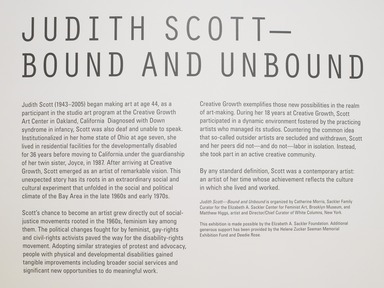 Judith Scott was in her mid-40s when she began making art at Creative Growth Art Center in Oakland, California. Born with Down syndrome, and largely deaf and mute, she was institutionalized in Ohio for thirty-five years before her twin sister introduced her to Creative Growth’s unique studio program for artists with developmental disabilities in 1987. 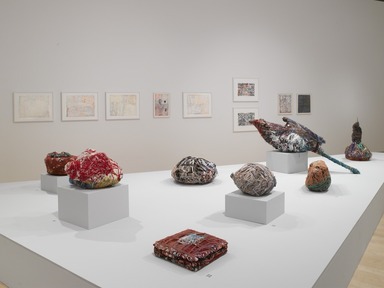 For eighteen years, until her death in 2005, Scott worked with a single-minded devotion on producing idiosyncratic and increasingly complex pieces assembled from found materials encased in thread, yarn, torn fabric, and other fibers. Focusing intently on one work at a time, she fashioned each piece over a period of weeks or months, before signaling definitively that the object was finished—and then promptly moved on to start a new one. It was the process itself of making her objects that drove her creativity. 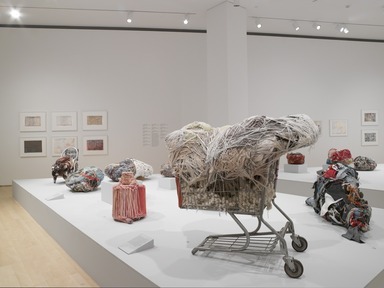 Scott would carefully and methodically assemble a work by tying, weaving, binding, and enveloping a found object—or multiple found objects—ranging from something as small as a ring or a piece of paper, to a bundle of twigs, an electric fan, a child’s chair, or a shopping cart. The original inspirational object was often ultimately enveloped and hidden. 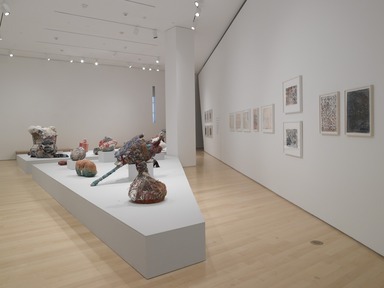 Although Scott worked intuitively and without apparent influences or precedents, the result of her efforts is a remarkable body of highly sophisticated and multilayered sculptures closely related to current developments in contemporary art. 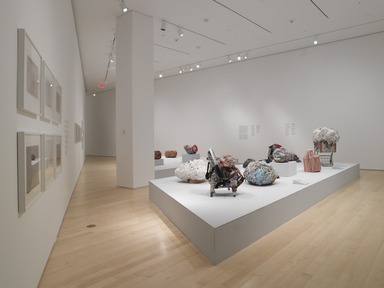 Presented in the Elizabeth A. Sackler Center for Feminist Art, Judith Scott—Bound and Unbound brings the work of an artist personally removed from politics into a conversation about the role that second-wave feminism and the disability rights movement played in making it possible for her to become an artist understood today as significant and influential. 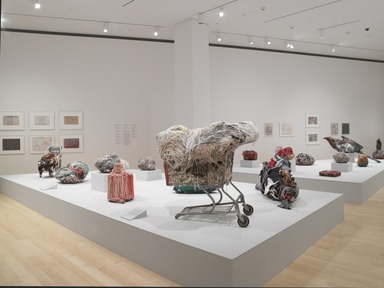 The exhibition critiques the long, unresolved, and losing struggle to categorize and quantify art by people with disabilities into a discrete school or movement, intentionally removed from the larger frames of social and cultural history. Ultimately, the exhibition also presents a voice in the contemporary art world that resonates and engages, and also challenges us with complex questions about how best to balance exceptional biographical narratives within larger critical discussions of an artist’s work. Judith Scott—Bound and Unbound is organized by Catherine J. Morris, Sackler Family Curator for the Elizabeth A. Sackler Center for Feminist Art, Brooklyn Museum, and Matthew Higgs, artist and Director/Chief Curator of White Columns, New York. The exhibition is accompanied by a fully illustrated catalogue published by the Brooklyn Museum and DelMonico Books-Prestel. The exhibition will tour to venues to be announced.